It's complete theft and income redistribution. As with most things in today's "give no ground" political environment, the obvious problems with SS will not be addressed unless and until there is utter, catastrophic failure. ...but remember as well that most public & private defined benefit pension funds use 7% to 8% investment returns to calculate their minimum funding requirements. None of it portends well for the future. It is taxes. It is collected year by year and paid out to other purposes in that same year. He only thinks it's theft because he is confused into thinking it's some sort of investment. It always has been. 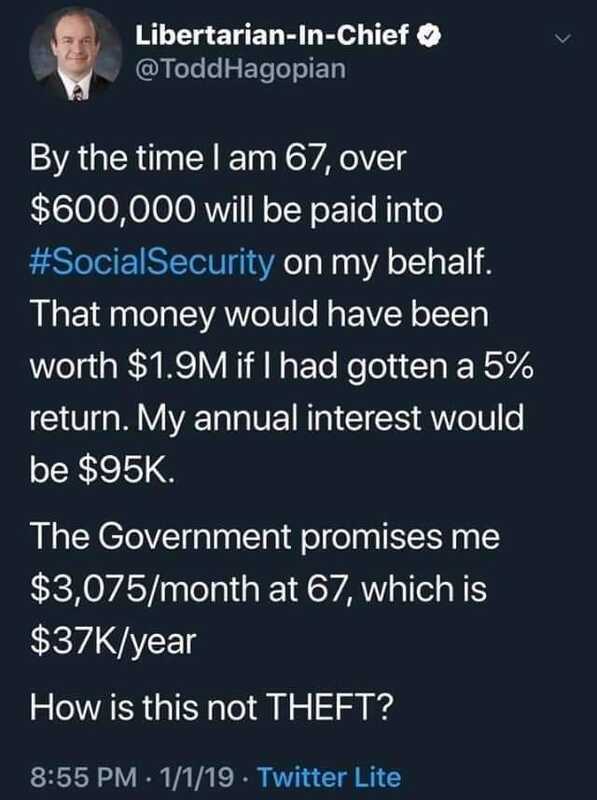 And if you die at 68, .gov keeps the balance rather than letting you pass it to your heirs (some complications if your spouse is alive and paid less into it). 5% return is dream, the professional bankers needed a trillion dollar bailout to cover their gambling debts (that was theft!) and they would have been the one's with MY money! SS is a wage earner tax and you do get it back ... Anyone who tells you different is misinformed or trying to put one over on you. MY SS$ showed up (again) last Wednesday. So if you're getting your SS money back then you certainly don't need me to pay Social Security taxes, do you? Let us know how that works out for you in about 15 years. Or, acquire a taste for Dinky Doo. Just wait until it is means tested. If you were responsible and saved your money, you don't need it, so you get nothing. It's already means-tested. If you're single and make more than $25K a year, you are taxed on your SS earnings, even after "full" retirement. The government payout isn't guaranteed either. No more than the 5%. Why not give people the option to split their SS contributions between private and government-managed? IIRC Bush 41 floated that, it was immediately shot down. FICA is a TAX. Nothing more, nothing less. There is NO CONNECTION between how much you pay in versus how much you receive. And an ENORMOUS number of people receive a check every month even though they never paid in a dime. FICA is a scam designed to buy votes and make people dependent on big gov. It's the biggest pyramid scheme in the history of planet Earth.